A low volume medical device manufacturer wanted the outside of their product to look as cool as the technology on the inside of the box. We designed a two-part (top and bottom) enclosure using durable ABS sheet with cutouts for cables, sensors, an electronic control panel, integral hand holes and some sweet design flair. 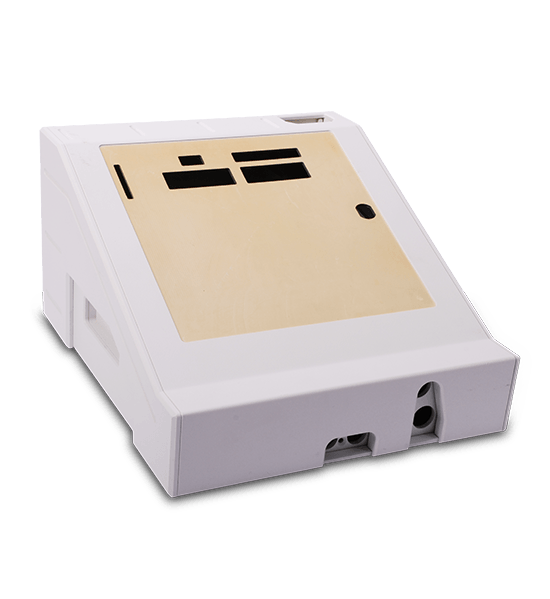 We also incorporated pem nuts and threaded inserts to the enclosure to improve assembly quality and reduce assembly labor. It all fit together like an expensive molded enclosure at a small fraction of the cost. From our background with retail store displays, we believe products launch best with the “sizzle and the steak.” Customers will form an opinion about the perceived quality and technology of your product based on the look and feel of the enclosure in which it abides. Make a strong first impression. Do it right from the start.